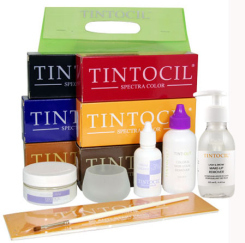 This start up kit contains one of each product of the Tintocil line. It is offered at an affordable price and intended to boost profit if you are just starting a business. * 1350 Tintocil Black 1 oz. * 1351 Tintocil Light Brown 1 oz. * 1352 Tintocil Auburn 1 oz. * 1353 Tintocil Brown 1 oz. * 1354 Tintocil Blond 1 oz. * 1307 Tint Out 2 oz. * 1358 Tintocil Paper Pads.